Jeju Island is very far away from all the ferment and fervor of OccupyWallStreet, OccupyChicago and OccupyBaltimore. It is even further away from OccupyNewLondon (which is going to start on Sunday, 4-6pm every day, down by our infamous whale tale). Jeju is in South Korea and it is apparently very beautiful. Unofficially, it is known as Honeymoon Island, because Korean newlyweds go there after the wedding (obviously). The area is studded with coral reefs and UNESCO designations. Officially, Jeju was dubbed the “Island of World Peace” by Roh Moo Hyun (South Korea’s president until 2009) because it was the site of a 1948 democratic uprising that was met by slaughter—it is estimated that between 30,000 and 60,000 civilians were massacred by the military. Against this backdrop of beauty and suffering, there emerges a new kind of struggle. In the tiny fishing village of Gangjeong, the South Korean Government is building a deep water naval base. In the process, they are dredging the sea and destroying coral reefs and upending life for the residents. the Jeju base would host up to 20 American and South Korean warships, including submarines, aircraft carriers and destroyers, several of which would be fitted with the Aegis ballistic-missile defense system. All of this saber-rattling and base building would put Honeymoon Island in the crosshairs of the next global conflict—or the next battle in the already seething global conflict. Take your pick, but either way the people of Jeju are saying “no thanks” to all of that! The navy, as usual, has never consulted the villagers for the work today. Do you believe? The navy totally ignoring not only the opinion of villagers but also the demand of the Island Council and even the Island government, conducted six times of test blast of the Gureombee [coastline area] today. Eleven activists were arrested during their resistance in the sea and land. And this is just the latest. 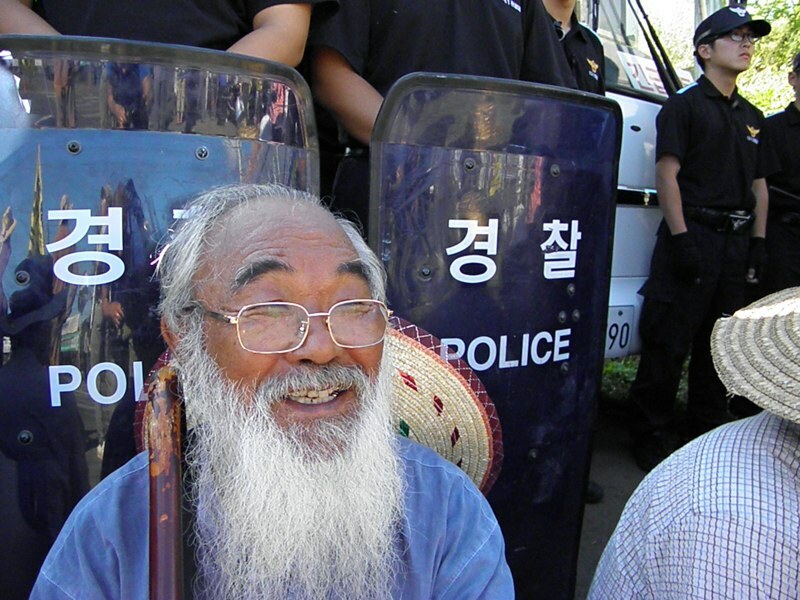 Over and over again, Catholic priests, Buddhist nuns, villagers, students from the mainland and people from every walk of life have been arrested in civil disobedience by the South Korean police. Just a few days ago, nine Catholic priests hopped the fence and were arrested. The struggle is getting more and more international attention. We can’t all go to Jeju (or maybe we can), but in the meantime American Friends Service Committee is hosting a “Peace in Asia and the Pacific” conference later in October and Yanae Pak, a Jeju activist, will be there to talk about their militant nonviolent resistance to the base. I live in South Korea and spent 4 or 5 days staying at the peace camp in Gangjeong. What wonderful, peaceful people with such care for their country. To see the Geurombi (which is essentially a massive volcanic rock 1.2km long) being blasted and broken up by the navy and their contractors (Samsung) is sad and disgusting. Jeju wants to be one of the seven natural wonders of the world – and then the government allows this naval base. And yes, everyone smells American fingers in the pie. It’s senseless and ridiculous in a world where governments should be striving for less war, not more. Please send more information regarding the upcoming conferences in 2012. Do not let the 7th tragedy to Jeju Islanders. USA is a big threat to peace in Asia. Wipe them out of Asia.